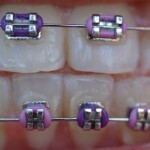 Home » Posts » Dentistry » orthodontics » Orthodontic bonding: is primer necessary? Orthodontic bonding: is primer necessary? The use of bonded orthodontic brackets is important for effective and efficient orthodontic treatment. Some studies have suggested that priming with adhesive resin to improves bond strength but other studies have contradicted that view. The aim of this review was to evaluate the association between adhesive resin and shear bond strength of orthodontic brackets to enamel and to analyze the association among other experimental variables. Searches were conducted on the PubMed and Scopus databases. In vitro studies that compared adhesive resin application to a group without adhesive resin application with a primary outcome measurement of shear bond strength in MPa were considered. Two reviewers independently selected studies and assessed risk of bias. 6 were considered to be a low risk of bias, 3 at moderate risk and 1 high risk. Meta-regression demonstrated that 5 experimental conditions explained 86.1% of heterogeneity and four of them; photo-curing time, force location, bracket area, and crosshead speed of the testing machine had significantly affected in vitro shear bond testing. The shear bond strength of metal brackets was not significantly affected when bonded with adhesive resin, when compared to those without adhesive resin. The prior application of adhesive resin does not influence the bond strength of orthodontic adhesives. Thus, this step could be set aside during metal bracket bonding to enamel regardless of the type of orthodontic adhesive used. The variables that significantly do influence in vitro bond strength are photo-curing time, force location, bracket area, and crosshead speed of the testing machine. This review is restricted to in vitro studies and while the findings indicate that use of adhesive resin did not improve bond strength this may not be directly applicable to the clinical situation. However, we recently reported on a clinical trial (Dental Elf 22nd Jan 2015), which suggested that bracket failure rates were similar with out the use of primer, but additional clinical studies are needed to confirm these findings. The authors also highlight that there was a considerable degree of heterogeneity between the studies much of which was due to different methodological approaches. They also note that 2 of the included studies were conducted on bovine teeth. Altmann AS, Degrazia FW, Celeste RK, Leitune VC, Samuel SM, Collares FM. Orthodontic bracket bonding without previous adhesive priming: A meta-regression analysis. Angle Orthod. 2015 Jul 15. [Epub ahead of print] PubMed PMID: 26177358. Dental Elf – 22nd Jan 2015 – Orthodontic bonding: no need for primer? No need for primer in orthodontic bonding? Thank you Derek Richards for sharing our review! We performed the metaregreasion in order to overcome the heterogeneity and find out which variables influence the in vitro bond strength. For sure, clinical trials are needed to confirm, however, now we have some good evidence that may guide us. Mechanical properties are surely a way to look at the performance of the acid-etch technique. However, primer is not used solely for bonding. But also, for sealing.